We are one of the leading manufacturers and suppliers of Plants for Recycling & Rerefining of Used Lubricating Oil having supplied scores of plants across the entire middle east and Africa . Wiped Film & Thin Film Evaporation: The Wiped Film Evaporator is widely used world over for re-refining of used lubricating oil . This is supplied as a continuous or a semi continuous plant depending upon the capacity and the location of the plant .The minimum distance between the evaporating surface and the condenser coupled with short residence time makes this process one of the best in the market. The clay treatment process, regenerative clay process or solvent extraction can be used for the purpose of polishing the distilled product, which is obtained from evaporation process, into supreme grade base oil of different viscosities. Batch Distillation: We offer Batch Distillation technology to our valuable customers. This technique is widely used for highly effective recycling and refining of used lubricating oil in small scale plants with small recycling and refining capacities. The distilled product obtained from this batch distillation process can be segregated into different viscosities of base oil. Different methods that can employed for imparting a good colour / oxidation stability/ high viscosity indesx of the distilled products are solvent extraction, regenerative clay process and clay treatment methods. Regenerative Clay Process: We offer extremely effective Regenerative Clay Process to our valuable customers. Available with us at industry leading prices, this process is used for polishing of the distilled product from either the WFE or the batch distillation plant. The distilled oil is passed through a bed of special clay to obtain a high grade of no smell , low colour lube oil . This clay is highly cost-effective and can be reactivated in situ and can be used for over 150 times more than the normal clay. The processed oil is known for its odourless composition, characteristic colour and high stability against oxidation. The spent clay obtained is non-hazardous and can be disposed off in a normal landfill. This process is suitable for small capacity plants . NMP Solvent Extraction: We hold expertise in offering NMP Solvent Extraction process to our valuable customers. The used lubricating oil distilled in a WFE or Vacuum Distillation are treated by solvent extraction for improving its colour , removing foul odour and to increase the viscosity index. The solvent extraction technology is the most preferred method of polishing for big capacity plants exceeding 1000LPH. This process is designed and supplied in both continuous and semi continuous manner depending upon the capacity of the plant. This process does not produce any solid waste, the solvent is recycled back and the extract left behind is used as fuel in the plant itself. This process increases the oxidation stability and the viscosity index of the base oil. Clay Treatment Process: Our Company is instrumental in offering Clay Treatment Process to our valuable customers. This process is highly demanded in refining and recycling of various used lubricating oil due to its low cost of polishing. 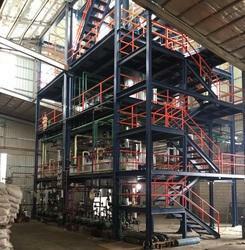 This process is widely used in different small investment plants as it produces reasonable characteristic colour and oxidation stability of the final distilled oils. Looking for Plants for Recycling & Refining of Used Lubricating Oil ?